This is the third Anubis product that I have encountered and the cleansing mousse contains both Vitamin C and Ascorbic Acid. Vitamin C is one of the most hardworking ingredients and is a powerful antioxident which helps reduce uneven skintones, minimise fine lines and wrinkles plus it helps to improve elasticity. The foam is silky soft and smells absolutely divine of fresh ripe oranges, once on the skin it is quite moisturising and does remind me of Ole Henriksen african red tea foaming cleanser which I adore. If your hair is feeling stressed, dry and damaged, then this mask by Osmo might just be what you are looking for. It is described as being a deeply nourishing treatment which helps to restore moisture, elasticity and smoothness and to do that it uses an extract of Jojoba to add shine, Patchouli Oil to tame that frizz and Ylang Ylang to soothe and control excess sebum. One part of my body which is my least favourite is my feet, I hate feet per se but I do my best to look after them so noone else has to touch them. This foot cream includes relaxing and antiseptic lavender, uplifting mint and with a spalsh of tea tree oil it smells even more divine than you can imagine. One on the feet, it is instantly cooling and soothing as well as moisturising. Model Co is one brand I don't know that much about and this highlighting trio palette is really beautiful, compact and easy to use. This trio contains a luminizer in shade champagne for highlighting cheekbones, a satin-finish blush in shade peach for cheeks and a glowing bronzer in shade bronze that helps contour and define. Each shade is said to be universal and they blend really well with enough pigmentation to allow you to build up more colour if you feel the need. This soap is 100% Vegan, 100% Natural and 100% eco friendly and it smells just absolutely amazing. It features shots of organic pomegranate and pink grapefruit essential oils which makes the soap smell as fresh as freshly squeezed fruit. This soap is ideal for dry, sensitive or mature skintypes and it leaves your skin feeling nourished, moisturised and cleansed. If this sounds like something you wish to try then there are three subscription options and postage and packaging is £3.25 per delivery and it is a tracked package. A monthly subscription costs £10 per month (plus P&P). This is a rolling subscription, but you can cancel anytime. A 6 month subscription consists of a one-off payment of £54 (plus P&P), which is £9 per box. So there you have Dollibox, a cute little box which I have thoroughly enjoyed using to discover some new brands whilst giving myself some little extra pampering. Nice selection, in the past I've gotten Glossybox, Birchbox and the Look Fantastic Beauty Box. This looks like a lovely box, when I'm back to having a subscription box this is certainly a contender! I've never seen these boxes. What a fantastic idea! Do you think you can get delivery timed with time of the month as a cheer up treat?!!! I love the sound of the orange scented cream. Sounds divine. I'll have to keep a look out for it. 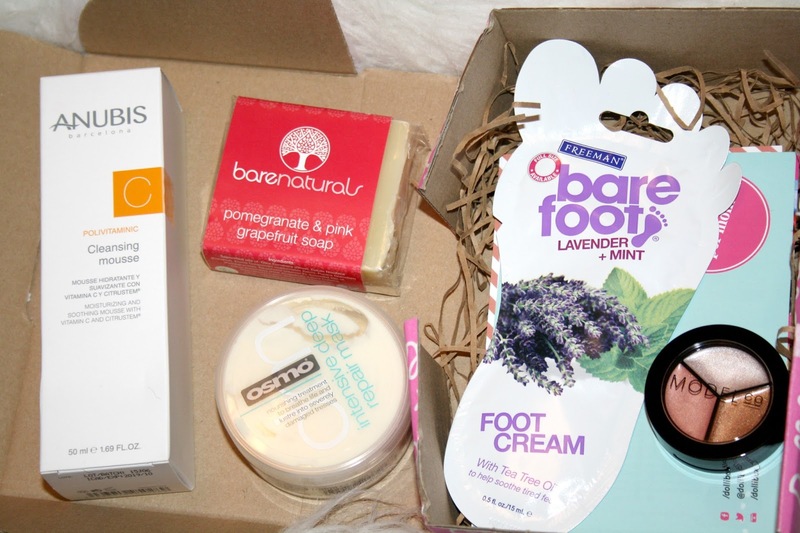 This box looks lovely, I love foot creams and treatments my feet are so bad they take a lot of looking after. I really like the selection you have received here, I don't currently subscribe to any box but had loads of beauty for Christmas - Elemis, Philosophy and Number 7 mainly. That soap sounds lush. And the Osmo, my experiences with Osmo have been brilliant so would love to try that out. I love these boxes. They are such a good idea. I'm hoping to do a subscription for one as a Christmas present for my sister next year. She would love it. This looks like a great box, I really love all of the boxes you can get! I really like the look of the Highlighting Trio the colours look great. The Model Co highlighting trio looks fab! This looks like a fab selection of bits I've not heard of some of these brands before. The highlighting trio looks great. I've not used a highlighter before but am tempted. What a lovely box with some really nice products. I like the sound of pomegranate and pink grapefruit soap. What a lovely box - the selection looks great. The Model Co. Highlighting Trio looks incredible. Can't wait to add it to my list of must haves. The box looks beautiful. Even though I am not into beauty that much I think I should get into it. I don't look after myself at all. Don't treat myself. Should be something in 2016 I should look into. That soap sounds delicious - I've never had a beauty box delivery service before but must look further into this. Great review. I think this is a great box. I love a bit of eye shadow and the foot cream looks fab. I plan to give my feet a huge treatment soon. :) They need some care. What a fantastic box it contains so many useful products and so luxurious too. i like the look of the mousse! What a cute little subscription box, I may have to subscribe! I love beauty boxes! The items you got in this one are great! I've given up on subscription boxes as I find many of the products I receive I never use and they just sit there wasting my money. Although I love the idea, they just don't fit in with my lifestyle anymore. It looks like a nice box but as I'm not very good with keeping up with the skincare side of things the only thing I'd end up using is the highlighting trio. Ooo, looks very interesting and it also at affordable prize. I like how it has plenty of goodies. Great review! You've got some nice products in the beauty bag. The models co highlighting trio looks beautiful. This looks great, Model Co are a brand I really like too. Never heard of Dollibox, some great items there. That Model Co. Trio looks gorgeous! Looks like a lovely box, really like the look of the highlighter trio. Not heard of Dollibox before though I do like a good beauty box and I am looking for one for subscribe to. One of the cheapest boxes I've seen (price) around, good stuff! I love the look of the highlighting trio as I think it would be perfect as a multi use product too. I must get round to signing up for a subscription box; must be great having something to look forward to each month! Could do with that foot cream today after an epic long walk! Nice selection of products! The highlighting trio looks great. I would love to try it. Oh lucky you! How much I hate it, that I can't get any kind of subscription boxes where I live. Everything in the box looks amazing, especially the cleansing mousse. That highlighter trio looks really gorgeous! One can never have enough beauty box to unbox and this seems like a fab subscription service. Looks like great box! I totally like most of them items so would be great to try! i need to sign up!